Hezbollah Secretary General Seyyed Hassan Nasrallah says the Egyptian Revolution will leave an impact on all regional and global developments. “It has always been said that Egypt is the mother of the world. This is right and you (Egyptians) who are there, you are the great people who can, with your will and solidarity, change the face of the world,” Nasrallah said in a speech on Monday. “You are waging the war of Arab dignity. Today, with your voices, blood and steadfastness, you are retrieving the dignity of the Arab people; the dignity which was humiliated by some rulers of the Arab world for decades.” He explained that the delay in announcing Hezbollah\\\\\\\'s stance was not because of hesitance or any confusion. Hezbollah was afraid if it announced its stance earlier, the protesters in Tunisia and Egypt would be accused of being moved or controlled by Hezbollah or the Islamic Revolution Guards Corps and they would be accused of serving a foreign agenda, Nasrallah added. Now that the people are overcoming the Mubarak regime, “We are gathering here to announce our solidarity and our standing side by side in support of the people of Egypt … We are also side by side with the people of Tunisia,” the Hezbollah leader said. Nasrallah elaborated on some fundamental points about the Egyptian revolution. “We are witnessing a real popular revolution; a real Egyptian nationalist revolution. Muslims and Christians are participating in this revolution. Islamic factions, secular parties, nationalist parties and all walks of life are participating,” he said. “This revolution is the result of the determination and commitment of the Egyptian people,” and contrary to the US and Israeli propaganda that say it is just “a revolution for bread,” the movement is also a “political, humanitarian and social revolution,” he pointed out. Millions of Egyptians have for two weeks taken to the streets across the country to call for the ouster of the Mubarak regime. More than 300 people are estimated to have been killed since the protests began. People from all walks of life are flooding into Cairo\\\\\\\'s Liberation Square and many have been spending nights at the square despite heavy military presence. Also in Alexandria, people have gathered at the city\\\\\\\'s main square chanting their revolution will not die. Meanwhile, the Egyptian revolution coalition has reportedly rejected negotiations with the government of Vice President Omar Suleiman. On Sunday, millions of Egyptians were out on the streets in the capital and other major cities to honor hundreds of their countrymen killed during the anti-government rallies. Hostility toward the United States is widespread among the protesters as they hold Washington responsible for Mubarak\\\\\\\'s grip on power. Demonstrators say they will not leave the streets until Mubarak steps down. 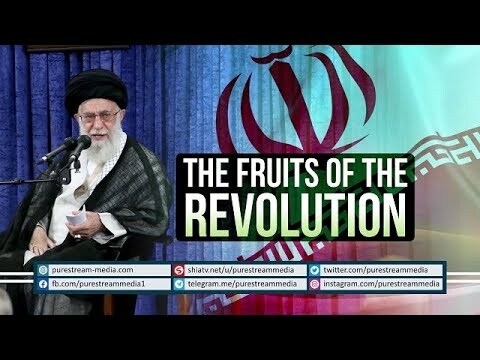 4 reasons why we call the the revolution \"Islamic\" and not \"Iranian\", beautifully explained and dynamically presented. The Islamic Revolution is building the economic, social and military foundations for the arrival of Imam al-Mahdi (A), the awaited saviour of mankind and when he returns, this revolution will go global InshAllah. We are preparing, O Imam-e-Zaman! Ahmadinejads Speech at Azadi Square to mark the 32nd anniversary of the Islamic Revolution. Iranian President Mahmoud Ahmadinejad has said that a new Middle East will be created in the near future without the United States and Israel. "I assure you that despite all evil and complicated plans, and thanks to the resistance of nations, there will be a new Middle East but without the US and the Zionist regime [of Israel]," he told the Iranians gathering at Tehran's Azadi Square to mark the 32nd anniversary of the Islamic Revolution. The Iranian president also urged the arrogant powers not to interfere in the internal affairs of the region's countries such as Egypt and Tunisia. "What are you doing in Afghanistan? What are these military bases in the region for? Are you compassionate or hypocrite?" Ahmadinejad asked. He also argued that the West is deceitful in claiming that with the two-state slogan it can pave the way for Israel to dominate the region. Hailing the revolution in Egypt, the Iranian president warned the Egyptian people to be vigilant, insisting that "It is your right to be free. It is your right to decide your government, and it is your right to freely express yourself about your country and global issues." "Be united and do not fear corrupt governments, and victory is near," he added. In Egypt, thousands of people gathered outside the presidential palace in Cairo on Friday after President Hosni Mubarak refused to step down amid repeated calls for his resignation. Tensions are expected to escalate further on the eighteenth day of pro-democracy protests as millions are to come together at mosques for Muslim communal prayers on Friday. [30 July 2012] Bahrainis not to give up revolution - News Analysis - English Almost a year in a half into its revolution, Bahrainis continue to take to the streets calling for the end of the Al Khalifa regime. And the regime continues with its brutal crackdown, continuing arrests, and oppressive tactics when dealing with demonstrators. And a year and a half later, the western supporters of Manama continue trying to look the other way as people continue to die in Bahrain. [05 Aug 2012] Is Saudi Arabia on the edge of revolution - News Analysis - English As revolutions have taken place in the region, the rumblings have been felt in many places and it appears that the next epicenter could be Saudi Arabia. As more demonstrations have taken place in the kingdom, another protester has been killed in the Eastern Province. Also reports say that a Saudi policeman has also been killed. As the violence continues and claims of abuse and illegal incarceration rise, many question what lies ahead in this repressive kingdom as its people continue to seek equality. Are we on the edge of a revolution in Saudi Arabia? Celebrating the victory anniversary of the Islamic Revolution; With only hours to the beginning of the rallies marking the 35th anniversary of the victory of the Islamic Revolution in Iran, celebrations have reached its peak; fireworks and colorful illuminations have brightened the nights of most Iranian cities. The celebrations and festivities are not limited to Iran; according to officials, celebrations have been held in 60 world countries, during ten days of festivities on the occasion of the victory of the Islamic Revolution. Iran\'s Islamic Revolution has been commemorated in other countries as well. Ceremonies have been held in Afghanistan, Iraq and Syria to mark the event. The ceremony in Iraq\'s Kurdistan region was attended by Iranian clerics and officials including the head of Iran\'s consul in Arbil. Kurdistan\'s regional officials were also present, including members of the region\'s main party, the Kurdistan Democratic Party. Iran\'s Islamic Revolution was also marked in Afghanistan\'s capital Kabul, and the Syrian capital Damascus. Participants hailed Iran\'s revolution and the progress the country has made during the past years. What is the backbone and the essence of the Islamic Revolution? What is the lifeblood of the Islamic system? What drives it forward? What strengthens it? What is the underlying factor that has contributed to the Revolution\\\'s victory after victory over the enemy? The Leader speaks. You may know some people who used to be Revolutionary and later turned their back on the Islamic Revolution for personal reasons. Is it a correct thing to do? How does it impact the Islamic Revolution? The Leader speaks.